Mini eggs are about quarter of the size of a normal egg. 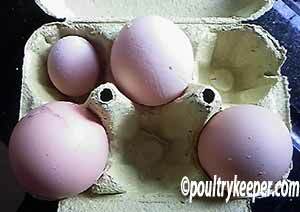 They usually don’t have a yolk inside, just the ‘white’ or albumen as it is technically called. A mini egg is caused when a small foreign object enters the oviduct and triggers the normal formation of an egg, so just the same as a yolk, it gets wrapped in albumen and then popped inside an egg shell. It can be interesting to try to see what it was that triggered the egg formation if you break the mini egg open. Normally only one mini egg is laid and then normal laying continues and it is nothing to worry about.